In this school, we provided on January 21st, 2010 the first library financed by the actions carried out during last year and by the numerous donations of our friends. Everyone understands the need for a good education and learning to read is part of this basic requirement. With a good supply of books children can learn to enjoy reading. This first library and others that will follow will help to establish the necessary standards to achieve this. To help us achieve this, there are many ways that you can raise money for the project. This website gives you some ideas: car boot sales, sales of local Senegal art, concerts etc. You can also make donations direct to our charity. And if you want to join us, please visit our membership section. With your help, our objective is to provide one new library each year to schools in Senegal and each school will be able to choose its own books. Appropriate cupboards and shelves will also be provided. 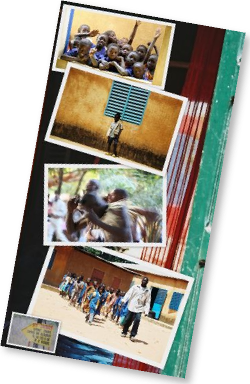 The books will be purchased locally in Senegal and the estimated cost of each library is 1000 Euros. Association EMANAYE "of paddy fields and books"